Government functions with your tax dollars…. So learn more about where that money goes, why that matters and how it relates to you as a women business owner. 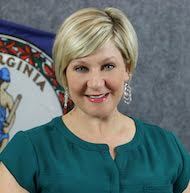 We will be joined by Kim Brewer, eVA Outreach & Marketing Manager, Department of General Services, Division of Purchases & Supply for the Commonwealth of Virginia. Kim will share details about one of the more transparent and efficient government contracting tracking programs in the country. *All webinars are recorded and available OnDemand. A recording of the webinar will be sent to all registrants. Kim joined the eVA program in August 2009 bringing with her more than a decade of marketing and communication experience in the private sector. Along with managing eVA's Outreach & Marketing efforts, one of Kim’s primary objectives is to educate businesses on the benefits of eVA and how to leverage its many tools, as well as, help businesses navigate Virginia’s purchasing process.